Australian lawyers have been waiting 30 years for an up-to-date and comprehensive treatise on contract law, a one-stop resource for unparalleled legal guidance. Thomson Reuters Australia is pleased to announce the highly anticipated upcoming launch of Heydon on Contract, produced by the Honourable Dyson Heydon AC QC. Heydon left no stone unturned on the topic by lending his qualified expertise in the form of 31 in-depth chapters. 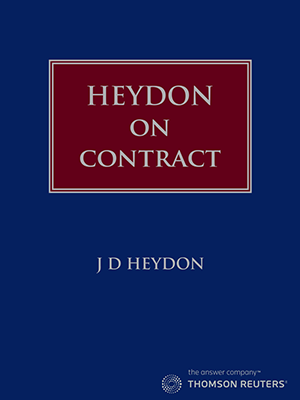 Order your copy of Heydon on Contract now for guidance on the most current analysis of common law and relevant legislation. The Honourable Dyson Heydon AC QC is a renowned former Justice of the High Court, leading scholar and commentator who is currently a judge of the Singapore Commercial Court. If you’re looking to gain contract law knowledge from the one place, look no further than Heydon on Contract which offers a complete picture of this area of the law. Whether you’re a judge, barrister or solicitor, your office bookshelf is in need of a publication offering legal analysis specific to Australia that you can put into practice now. 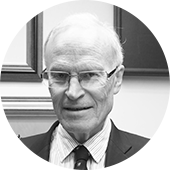 The Hon Dyson Heydon was educated at The University of Sydney (BA 1964, with First Class Honours and the University Medal in History) and Oxford University (BA 1966, with First Class Honours, sharing the Martin Wronker Prize, and BCL 1967, with First Class Honours and the Vinerian Scholarship). Heydon was a Rhodes Scholar for New South Wales in 1964 before being called to the Bar of England and Wales in 1971. From landing a fellowship in Keble College, Oxford University in 1967 to 1973, Heydon then became a Professor of Law at the University of Sydney from 1973, and Dean of the Faculty of Law in 1978 to 1979. Boasting an impressive legal career to date, Heydon practised at the Bar as a junior from 1979 to the Queen’s Counsel from 1987 until 2000, to later being appointed to the New South Wales Court of Appeal. When it comes to his career highlights, Heydon counts his tenure as a Justice of the High Court of Australia (2003-2013), along with serving as Commissioner of the Royal Commission into Trade Union Governance and Corruption (2014-2015) as two of them. Since then Heydon had been a Visiting Professor at the Faculty of Law at Oxford University and continues to adjudicate the the Singapore International Commercial Court. In addition, Heydon has written various textbooks and monographs on evidence, equity, trade practices law, restraint of trade and economic torts and speaks regularly on legal, historical and literary topics and other matters of public interest at industry events.